Time and money are running out for people to turn in their old cars for thousands of dollars. 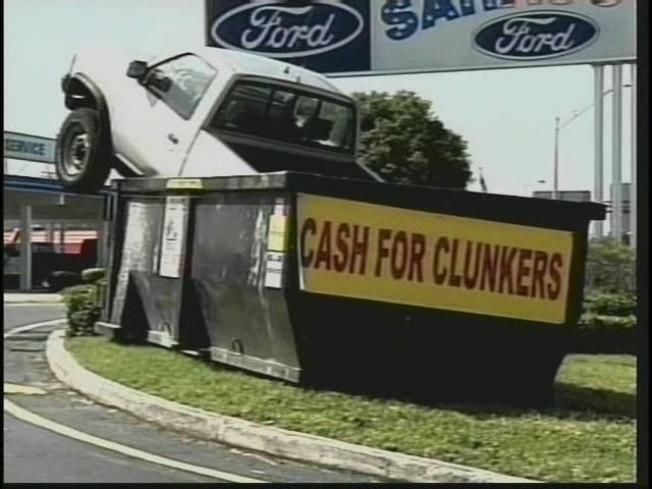 Dealers scrambling to file their paperwork before the "Cash for Clunkers" program ends have been given a reprieve by the Department of Transportation, who today extended the deadline to turn in paperwork until noon Tuesday. Deals must still be made by 8 p.m. Monday, the DoT said -- but dealers have an extra half-day to file their rebates. The $3 billion program wound down over the weekend as potential buyers flooded dealerships looking to scrap gas guzzling older models and buy new, more fuel efficient cars. Transportation Secretary Ray LaHood, speaking to reporters in Norristown, Pa., called the program an unprecedented success and a boon for car dealers, automakers, scrap yards and financial institutions. "Once the program ends at 8 o'clock there will be 700,000 to 800,000 cars that have been sold, most of them fuel efficient," replacing gas-guzzling cars and trucks, LaHood said. Transportation officials said through early Monday, dealers had submitted 625,000 vouchers totaling $2.58 billion.